It was with great delight that I was invited to attend Catwg Primary School for their Peace Mala Accreditation celebration, especially as they were the first school in Neath Port Talbot to achieve this status. I was also honoured to be presented with a Peace Mala prayer, written by a pupil of Catwg, which I now proudly display in my office. The Peace Mala project is a wonderful way in which our young citizens can learn mutual respect for all the communities of our world, both cultural and religious, and to promote peace on earth and tolerance of our fellow man. I am truly impressed by the message of Peace Mala; to pass on to our children the value of world harmony and compassion, in such a creative way, is a beautiful gift. 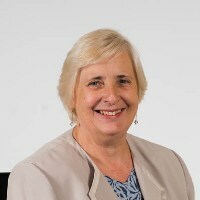 Gwenda Thomas has been the Labour Assembly Member for Neath since 1999. She was appointed the Deputy Minister for Health and Social Services following the elections to the National Assembly in May 2007. Gwenda was born in 1942. She was previously a Civil Servant and Chair of Social Services Committees of West Glamorgan County Council and Neath Port Talbot County Borough Council, former Community Councillor, Chair of the Governing Body Gwaun Cae Gurwen Primary School. She was also Chair of West Glam Campaign for a Welsh Assembly and Vice Chair 'Yes for Wales', Neath. Her interests include health, social services and the rights of carers and children, childcare and the voluntary sector. She is a fluent Welsh speaker.